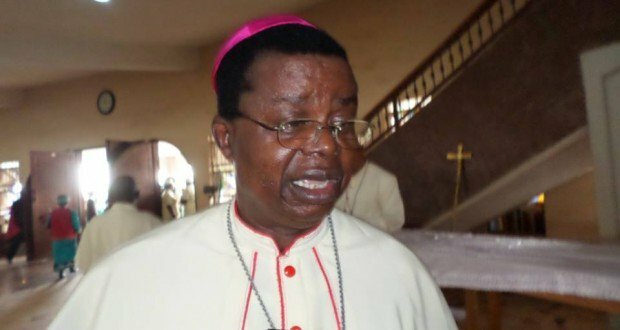 The Catholic Bishop of Awka Diocese, Most Reverend Dr. Paulinus Ezeokafor has described President Muhammadu Buhari’s two-day trip to Lagos State during a Christian celebrations as a slap on the face of Nigerian Christians. Ezeokafor stated that for the President to choose Maundy Thursday and Good Friday to visit Lagos showed disrespect for Christians. He insisted that Christianity and Islam were two dominant religions in Nigeria, and should be accorded same level of respect, just as the bishop asserted that President Buhari would not have made the trip if it was a Muslim celebration. The Bishop, who spoke at St. Patrick’s Catholic Cathedral, Awka while delivering his Easter message, said, “Government of Nigeria should always apply the principle of equity and fairness in its appproach to issues of national concern. “President Muhammadu Buhari’s two-day visit to Lagos State to commission a bus-stop on Christians’ most important days was a huge slap on Nigerian Christians. Ezeokafor said Christianity and Islam were the two major religions in Nigeria and should be accorded equal respect and recognition by the powers-that-be, not giving preferential treatment to one at the detriment of the other. He noted that the Maundy Thursday, Good Friday and Holy Saturday were days Christians concentrated on what they believed gave them salvation, even as he described Easter as the greatest feasts in the Christendom. He however admonished President Muhammadu Buhari to treat every section of the country equally irrespective of religious sentiments.